So when I had the opportunity to get the new, North Face Ventral hoodie (at a discounted price), I had to check it out. With a price tag of $220, I thought this was going to be just another overpriced mid-layer, but I couldn’t have been any more wrong. This has been my most trusted, and used jacket since I got it. From climbing multi-pitch routes in the Red Rock Canyon of Nevada, to 13F ski tours in Grizzly Gulch. This jacket can do it all. The jacket features the state-of-the-art Ventrix ventilation that solves the problem of heating up too quickly during ascents, and being too cold on the descents or slow periods. The jacket has perforations in key areas, i.e. under arms and upper back, that help dump excess heat by expanding and contracting to retain heat so you don’t sweat out. The outer material is made from a windproof, water resistant layer. Forearms have a durable ripstop finish. And the interior has a 80G polyester synthetic insulation. And did I mention the whole thing is super lightweight at ~15oz. Similar jackets/hoodies in the market are the the Arc’teryx Atom LT Hooded Jacket ($259) and the Patagonia Nano-Air Insulated Hooded Jacket ($299). The Ventrix falls in there at the cheapest option of the bunch. As far as my experience goes, I’ve put it through the ringer. 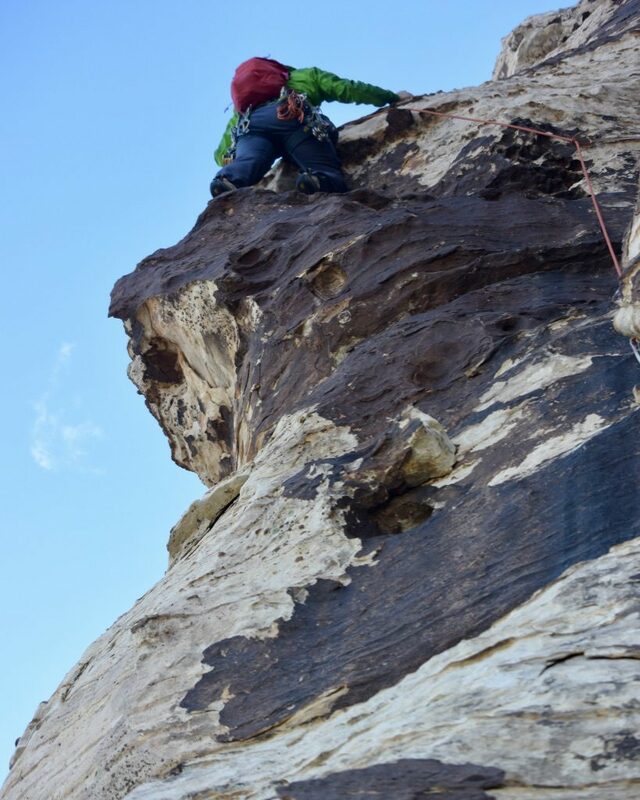 Starting with a multi-pitch climb on Purblind Pillar in Red Rock Canyon. 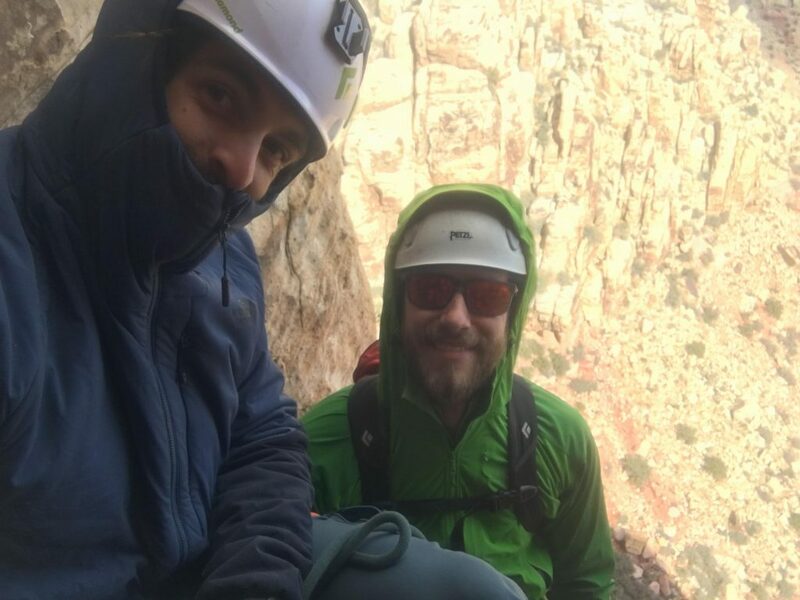 6 pitches of rough climbing, in the shade, in December. As you can imagine, it was shockingly cold. Especially when the wind picked up after we reached pitch 2. Without this jacket I surely would have gone hypothermic and been a real hazard to my climbing partners. And sure, any jacket would have helped on the climb, but none of them would have been durable enough at the same time. This climb involved a heavy amount of chimneying up large crack systems and stemming on the rough sandstone walls. There was a moment on each pitch where I really hammered my shoulder or arms on a sharp rock and thought I shredded the a big hole in it. But ever time, I was wrong, and the jacket held up and still went strong. The second true test of this jacket was on the ski tours around the Wasatch Mountains. Me and two buddies skied up Grizzly Gulch on a sunny Saturday morning where the temperatures reached a whopping high of 15F. And the entire day I wore only a long sleeve and this jacket, besides the shell I threw on for the descents. Nearly 3,000ft of vertical gain, in the sun, in the shade, in the wind, and up to 10K feet of elevation. It was cold, but I was working up a sweat, which is the most dangerous combination. But this jacket vented all the heat my body was pumping out on the skin upwards to the peaks. And then when the skin would flatten out or we stopped for a water break, the insulation would trap the heat to keep me warm. I don’t think I ever got too sweaty on that tour, even with a fully loaded pack on my back. To add to this jacket’s capability, it stayed warm, even when it got wet. This is usually a big problem with down jackets. I fell a few times on the skin up, more than I’d like to admit actually, but my buddies chose some real steep skin tracks to follow. I found myself, on a few occasions with arms, and chest, full submerged under the deep powder when I’d fall face first. The sticky snow would eventually melt when I got back to skinning, dampening the jacket. But no matter what, it stayed warm. As for the specifics. The fit is phenomenal, slim fitting. For a 5’11” 172lbs frame, a size large is perfect. The hood is comfortable to wear during runs and mobile activities, but it doesn’t get in the way or restrict visibility when rock climbing. The jacket zips up to the face to function as a buff when needed. Overall, this design is purely functional, with no extra features that aren’t needed. The perfect combination between a lightweight shell and an 800 fill down jacket. This has been my go-to jacket for highly aerobic activities. Trail runs on the snow hills around Park City, to ski tours in the Cottonwoods, and of course big rock climbing objectives where the temps could be variable. I’d recommend it for anyone who is serious about bringing the right equipment into the mountains to get the most out of every day. The ultimate question though, is it worth the $220 price tag? Yes. Hands down, yes!